Adapting to one’s environment may be essential to survival, but environments themselves change, and retaining adaptability can mean the difference between short- and long-term success. A team of researchers was recently able to observe and analyse the benefits to bacteria of different mutational strategies along these lines. The key was an ongoing experiment utilizing 50,000 generations of E. Coli. Using this repository of data, researchers with the Universities of Michigan and Houston were able to look at various strains of the E. Coli bacteria and watch as they adapted, diverged, competed with each other, and met different fates over hundreds of generations. 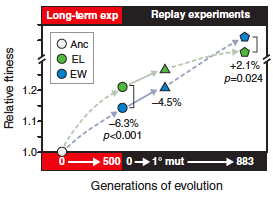 The results were surprising – lineages within the population that quickly adapted to the experimental environment (and were, in direct competition, more fit than the others) fared, in the end, worse than those that took their time. In essence, the ELs [Eventual Losers] followed a trajectory in the fitness landscape that allowed more rapid improvement early on, but which shut the door on at least one important avenue for further improvement. By contrast, the EWs [Eventual Winners] followed a path that did not preclude this option, giving them a better than otherwise expected chance of overtaking the ELs. Eyes on the prize, little E. Coli – even microbes have to think long-term some of the time. The Scientist has an article summarizing the study, or you can find the paper itself through Science.